The film begins as on any ordinary day. Mike Williams (Mark Wahlberg), Chief Electrical Engineer, prepares to leave for his shift on the rig. His wife Felicia (Kate Hudson) drives Mike to the port where he boards a helicopter along with the rest of the crew to fly out to the rig. With the exception of a startling bird strike on the helicopter (reminiscent of Sully!) the day seems very normal. Once on the rig, Mike and General Operational Supervisor Jimmy Harrell (Kurt Russell) encounter some BP Oil Supervisors who want to test the drilling equipment. Without a degree in engineering, I didn’t really understand what was going on in this part of the movie. The upshot of the whole thing is that Jimmy thinks there is a problem with the pressure on the drilling mechanism, while the executives decide that it is safe enough to continue drilling. Besides, they are behind in production on the rig, so better speed things up. This crucial scene is a bit muddled. Perhaps there’s too much technical for the general audience to absorb. The main thing it accomplishes is tense exchanges between the “good guys” led by Jimmy, and the “bad guys” who are the BP supervisors. As you know, the BP guys get their way and the drilling begins. Curiously, Mike, the main character, has almost nothing to do but stand and look on during this sequence. When the tense exchange is over, Mike goes to his quarters to Skype with Felicia. The writers missed a chance to help me understand what Mike actually does on the rig! 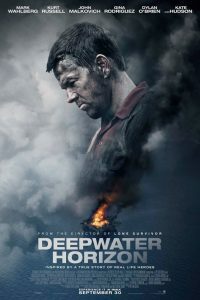 However, it’s highly unlikely that Deepwater Horizon will be remembered for the first thirty minutes. Director Berg moves into his element with the remainder of the film, when things begin to go terribly wrong. The explosions begin and the entire rig catches fire, creating a catastrophe. The Oscar-worthy photography, visual and sound effects, and makeup are excellent throughout. As the disaster spreads, Mike, Jimmy, and the rest of the crew try to rescue the rig and equipment with the help of the Coast Guard and a nearby ship. The long sequence is very intense, especially watching the men and women on board try to escape the rig and make it to safety. As we know, many did, but eleven crew members lost their lives. The most touching scene comes near the end, when the survivors of the explosion spontaneously kneel on the rescue ship and pray the Lord’s Prayer together. They give thanks for their safety, but pray for their comrades who were lost. It’s a very moving moment. Like the recent Sully, the heroes of Deepwater Horizon, were the ordinary crew members who did their best to save the lives of all. Unlike Sully, the incident was ruled to be the result of human error. Lives were lost, and an environmental disaster ensued. As an omen of what was to come, an oil-covered pelican crashes wildly into the rescue ship. In the 1970’s, there were a series of popular “disaster” movies, like The Towering Inferno about a fire in a skyscraper. Deepwater Horizon reminded me of Inferno with the exception that this was real, and not just Hollywood entertainment. Despite the problems of the early sequences mentioned above, Deepwater Horizon is a suspenseful and powerful movie. There are some grisly scenes, but they are realistic considering the casualties. The producers of Deepwater Horizon dedicate their film to those who lost their lives. We see their photos at the end of the movie, as well as appearances by those who lived, with the actors who played them. This is the third movie in a row I’ve seen where this has happened! (Sully and The Queen of Katwe were the other two.) It looks like this in the beginning of a trend.